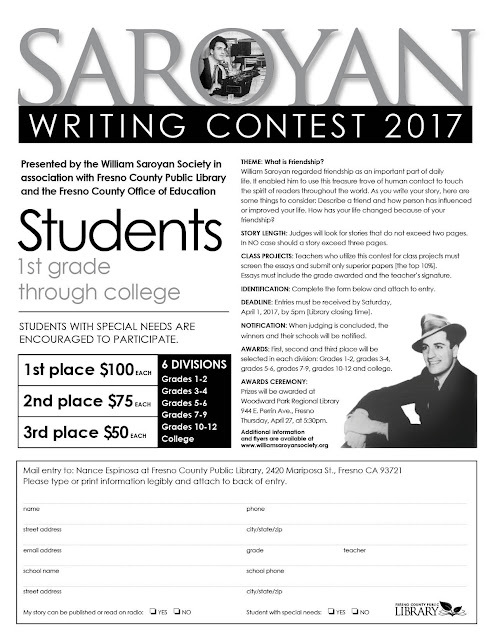 FCPL Kids: Saroyan Writing Contest Deadline Approaching! Saroyan Writing Contest Deadline Approaching! Have you entered the Saroyan Writing Contest yet? If not, do so soon! The deadline to enter stories is April 1st, by 5 pm. In case you've missed the announcement, the theme of this year's contest is Friendship. How have your friends influenced you? How has your life changed because of a friendship? You can pick up a copy of the entry form pictured below at any of the Fresno County Public Library branches, or print one from home by clicking here.